The village allotments are situated below Boehill Bridge by the canal and cost £1 a week. There is a book swap point in the red telephone box near the Play Park and Village Hall. Bring a book and take a book. Garden waste can be left at the site run by the village Composting Group. It is located on the left hand side of the road leading to the station and is open from Spring to Autumn every Saturday from 10 am to 12. Please follow the instructions about separating large pieces of wood from softer garden waste. During the summer months it is also open on Wednesday evenings from 18.00 for an hour. High speed broadband is now available in Sampford Peverell. The play park is opposite the village hall in Lower Town. It was completely refurbished in 2017 and now provides a great place for children of all ages to have fun in the open air. See http://sampfordpeverellplaypark.co.uk for more information. To contact the police, other than in an emergency, phone 101. This convenience store in Lower Town, near the car park, sells a wide range of goods including newspapers, fresh bread, and fruit and vegetables. It is also a Post Office which is fantastic for the village. The shop is usually open from 7.30 am until 9 pm but times can vary. Its Post Office services follow normal PO opening hours. The Little Turberfield farm shop can be found half way down the road to the station. Check its board for opening hours, but it is usually open all day Monday to Saturday. The next nearest farm shop is at Halberton. Some of the vegetables and fruit are grown on site and you can pick your own strawberries there in the summer. It also has a cafe. The shop and cafe open on Sundays during the pick-your-own season. There is a shop at Tiverton Parkway station which sells refreshments, greetings cards, and newspapers. Jo's hairdresser's is in Lower Town near the car park. The nearest is the Old Well at Waterloo Cross, on the A38 the other side of the motorway from the village. Many other shops and supermarkets are available in Tiverton and Cullompton. Bigger and more varied stores can be found in Exeter or Taunton, which are both easy to reach by car (in about 20 minutes) or by train. There is also a bus service to Exeter from the village. 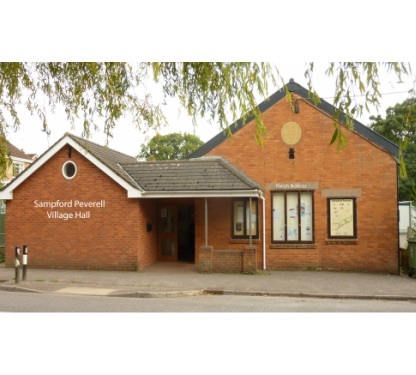 The Sampford Peverell Toddler Group meets every Tuesday during term times from 09.45 to 11.30 in the Village Hall. There is also a child health clinic on the first Tuesday of every month. See the village hall notice board for more details. Our village hall is located on Lower Town, opposite the public car park and near the Spar shop. It has a large central room with a stage, a small committee room, and a kitchen. A number of local groups meet here regularly and it is the venue for such activities as exercise sessions, dancing and whist drives.